If you think to be in a remote wilderness area means that the water you find is safe to drink — then think again! There are so many pollutants and pathogens floating around in our lakes and streams that the days of dipping your cup directly into the water for a drink are long gone. There’s lots of ways to treat water, like boiling or treating with chemicals. But I prefer the filtering systems. I find the easier it is to get water, the less dehydrated you become. For years I used pump filters. Lately, however, I’ve been using the Gravity Filter by Platypus. It’s a hassle-free system that works via gravity rather than pumping. Fill one plastic bag up with “dirty” water and hang it up higher then the “clean” bag. The water is filtered through a hose and a Hollow-Fiber Filter Cartridge. Last year, I purchased the four liter system, which worked great for large groups of four to six campers. 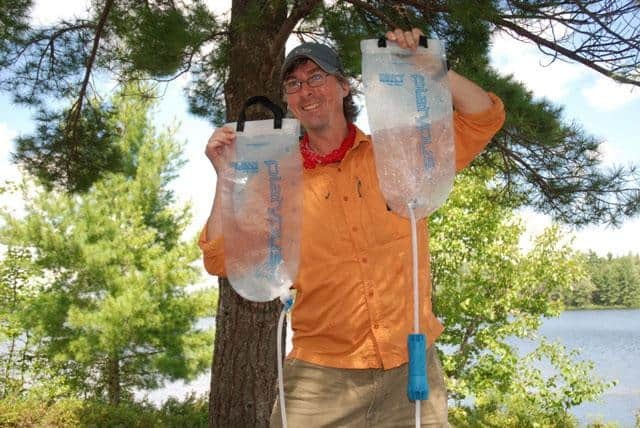 I downgraded this year, however, to the two-liter and packed that along for our 10-day family canoe trip in Algonquin Provincial Park. It was perfect. We just hung the system up in a tree when we got to camp, to refill our water bottles, and then did the same before heading out the next day. The only disadvantage over a pump filter is that when using the gravity system while en route, you have to stop to hang it up and let the water drain through. That’s never an issue with a pump filter. The gravity filter is much easier, though, and I find people in the group tend to drink more liquids because of it. The ﬁlter itself works just as effectively on single-cell pathogens than any other microﬁlter. One of the worst bugs to pick up is Giardia Lamblia. The tiny cyst gets into the water by being deposited via the feces of an infected animal. The usual host is the beaver, which is how this water born pathogen got its nickname: “beaver fever.” But it can be deposited by any mammal, including humans. It only takes 10 giardia cysts to infect your body. The microscopic protozoan, measuring 21 microns in length (the tip of a sewing needle measures 700 microns), hatches inside the small intestine with an incubation period from five days to several months, reproduces like wildfire, establishes a colony and then has a little party in your gut — making you feel as if Montezuma has moved north to seek his revenge. Symptoms can be severe or completely unnoticeable. They include: diarrhea, abdominal cramps, fatigue, weight loss, flatulence, and nausea — not a pleasant experience while being away from flush toilets and a local pharmacy. Usually, however, you get it when at home and then just assume it’s the flu. However, if the cyst does not get treated, it can cause severe problems. I’ve been infected twice and each case it took over a month to treat with antibiotics. Giardia is the most common pathogen to find swimming around in your water bottle. The good news, however, is that it’s the least dangerous. The protozoa Tularemia is a little more serious. It is similar to an infectious plague-like disease that infects more than 80 per cent of mammals. It is also caused by a bacterium, which gains entrance to the body and multiplies rapidly through the bloodstream, invading cells of the liver, spleen, lungs, kidneys and lymph nodes. When a parson is infected by Tularemia, they can expect the worst flu-like symptoms: a high temperature, headaches, chills, sweat, nausea, vomiting and body pain. Extreme symptoms, as if the others aren’t bad enough, are: swollen area where infection entered (hands, arm, face or neck), inflammation of eye membrane and general enlargement of the lymph nodes. The parasitic protozoa can be transmitted the same way as Giardia — ingestion of water contaminated by either the feces or a carcass of an infected mammal. It can also be given by inoculation from biting insects (bloodsucking flies, ticks, lice, or fleas). A very high number of trappers fall ill to this sickness due to their constant contact with the internal organs and body fluids of mammals. Apart from the pathogens, Giardia and Tularemia, there are many varieties of bacteria floating around in the water supply as well. E. coli gives you a nasty case of the trots. Kleisiella pneumoniae causes pneumonia, and Salmonella can give you either a bad case of food poisoning or a bout of typhoid fever. Then there are surface-water pollutants like gas fuel, pesticides and heavy metals from old mine sites. All of which gives good reason to treating water while you’re out there.